A DETAIL OF ROSE REQUIEM BY J.K.RUSS, OIL ON 3 PIECES OF SHAPED WOOD, FLOWER. 2009. 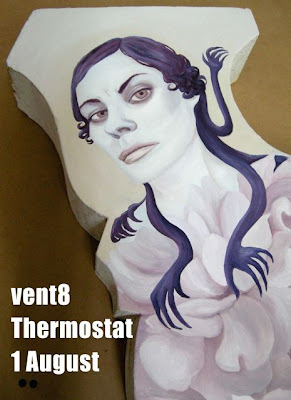 TO BE INCLUDED IN THE GROUP SHOW AT THERMOSTAT ART GALLERY IN PALMERSTON NORTH, SPIRITS, GHOSTS AND GREMLINS . 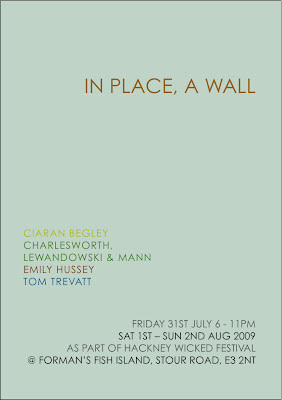 HERE'S AN INVITATION TO A GROUP SHOW INCLUDING LONDON-BASED ARTIST, CIARAN BEGLEY. I HAVEN'T GOT ANY PHOTOS YET, BUT HERE IS A SOLO COMMISSION CIARAN COMPLETED EARLIER THIS YEAR AT HOLD AND FREIGHT. WHEN JO AND I WERE IN LONDON THIS TIME LAST YEAR, WE STAYED WITH CIARAN AND RACHEL AND HE SHOWED US THE GALLERY SPACE IN DEVELOPMENT. GREAT TO SEE THE REALISED WORK ON THE WEBSITE.